I was watching this story with interest, and have to say I shook my head at the idiocy of it all and wondered what this Professor was really trying to prove. “(NaturalNews) Over the last month or so, the mainstream media has been making a huge deal about Kansas State nutrition professor Mark Haub who lost 27 pounds eating mostly Doritos, Twinkies and other junk food while drinking Diet Mountain Dew. But as usual, they’re misrepresenting the story. Consider this: You can lose weight by starving yourself (by eating nothing). That promotes rapid weight loss as long as you stick to it — which is, of course, nearly impossible to do for very long. If you’re fasting and living on nothing but water, suppose you gulp down one cashew once a day. You’re still going to lose all kinds of weight because you’re severely restricting your calories. Does that mean you’ve made some great discovery about a “cashew diet?” Of course not. It just means you’re burning a lot more calories than you’re consuming. What if you pop a Tic-Tac once a day while you’re fasting? Have you now discovered some amazing “Tic-Tac weight loss diet?” Nope. You’re just fasting with a Tic-Tac. It’s the same story with Slim-Fast. Can you lose weight on Slim-Fast even though it’s made primarily with processed table sugar? Sure you can! Just go a severe calorie-restriction diet, and drink some Slim-Fast from time to time. Heck, you can lose weight eating Halloween candy if you restrict your calories! The nutrition professor who lost 27 pounds was simply on a calorie restriction diet (a partial fast, if you will) that included a slew of processed junk food. Did he discover some miracle junk food diet? Nope. He just controlled his calories while poisoning himself with junk food chemicals and artificially modified food ingredients. And then there’s the whole nutritional side of this story. Twinkies, Ding Dongs and Oreos are called “junk food” precisely because they represent the nutritional equivalent of garbage. They lack virtually all naturally-occurring plant-based phytonutrients and deliver almost no natural minerals or vitamins. Instead, they’re made of processed, modified, factory-fabricated food ingredients that are linked to diseases such as diabetes, heart disease and cancer. And that’s not to even mention the aspartame in the Diet Mountain Dew this guy was chugging. Perhaps that’s why even this nutrition professor, while living on a “junk food” diet, was smart enough to take a multivitamin, eat a serving of vegetables and drink a protein shake each day. So even he wasn’t “living on junk food” as the headlines claim. He was supplementing his diet with at least some source of nutrition because he knew junk foods were going to leave him nutritionally deficient. It would be a totally different story if he lived on junk foods alone. In that scenario, he would very quickly become deficient in key vitamins, and he’d find himself in a hospital being treated for serious diseases as a result. The mainstream media, of course, completely fails to understand the real story here, and they’ve been reporting this as some sort of “junk food diet breakthrough” that suggests people can live on Twinkies and Ding Dongs while somehow losing weight and getting healthy. But we’ve already done that experiment in America, and the results are clear: Two-thirds of the population is overweight, and diabetes rates are soaring. Cancer is a multi-billion-dollar industry, and Big Pharma can’t wait for the coming wave of Alzheimer’s patients either. 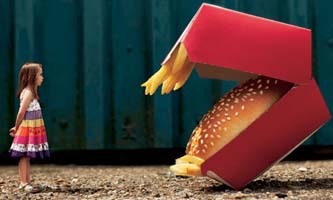 All that disease is promoted in part by the consumption of processed junk foods. If processed junk food caused healthy weight loss, America would be the healthiest nation in the world. Clearly that’s not the case, which means the real Ding Dong in this story is the nutrition professor himself who has set a terrible example for the nation to follow and has only offered wrongheaded encouragement to the junk food industry. Why not just cut off his own leg and announce that “amputation promotes weight loss” too? “How’d you do that?” her friends ask. It never ceases to amaze me the number of incredible claims made about weight loss and the new system that has superpowers to reduce your weight. The worst part is the number of media outlets that actually entertain the story without looking at all the facts first. It’s a shame to think they are that hard up for a story they have to run it, but also it’s a sad small part of society that may take it seriously. Absolutely – people who are looking for an excuse to justify bad eating habits will quote this story to people who are trying to say differently… There was no point at all to this study and I shudder to think of what thought processes led to instigating it. Next post: David Wolfe Retreat – Don’t Miss Out!